Last month when I was working my shift at The Cog, I happily discovered a rancher selling lamb out of a refrigerator in the back of a truck parked just up the street. How exciting is that? I couldn’t help but wonder how many other illicit direct-from- farmer-to-consumer meat purchases were happening all over the Bay Area on dark, deserted side streets. Of course I later discovered that it wasn’t an accident that the truck was on that particular street on that particular night. Turns out my friend Nishanga (another COG member) actually told the rancher it might be good to park there. The lamb was there, so I had to buy some. I bought one pound of ground lamb because that’s all he had that he could sell without a preorder. 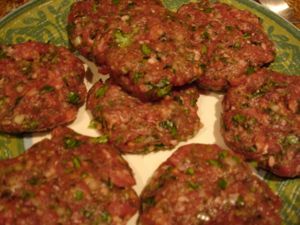 Back when I used to eat more meat, I used to make deliciously seasoned lamb patties often. They’re quick, easy, satisfying, and really tasty. It was fun to revisit these in a slaphappy sort of non-measuring way. Below is a list of all the ingredients I used, but since I didn’t measure you’ll have to eyeball and then cook up a little to taste for proper seasoning. And here’s an excellent idea: The holidays are approaching. Mini lamb meatballs nestled in small lettuce cups with yogurt might make a nice little appetizer. Think I’ll try it. Mix everything together and fry up a small amount to taste for proper seasoning. Form into patties, pan fry until just cooked through. 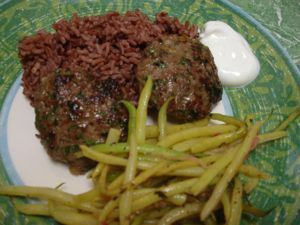 Serve with a dollop of plain yogurt, and whatever else you like. Lentils are a good choice as is any kind of rice and seasonal vegetables. This entry was posted in entertaining, from the market, holidays. Bookmark the permalink. Post a comment or leave a trackback: Trackback URL.